When I hear the word 'Creole' I immediately think of New Orleans. To me it means a combining of sights, sounds and flavors. The Creole-style food I have sampled over the years has been wonderfully creative and satisfying. Historically, Cajun and Creole recipes were passed down verbally with little regard to exact or recorded measurements. One's taste was the only judge for the correctness of ingredients and the seasoning of a particular dish. There is, however, a certain formula called the "Holy Trinity" of Louisiana cuisine: bell peppers, celery and onion. Rice is also an important accompaniment to Creole and Cajun dishes.The recipes are comforting and satisfying, flavorful and, at times, not particularly healthful with the addition of sausages, pork, ham and rich butter. Moderation is the key. Today's recipe has two of the 'trinity' ingredients and is served with English muffins instead of rice. The delightful combination of Creole flavors makes for the out-of-the ordinary breakfast that is actually diet-friendly. On medium-high heat, coat the bottom of a frying pan with olive oil and a T or so of margarine (Smart Balance). When the oil is hot, add onion slices and green pepper and sauté until almost tender. Add sliced mushrooms and continue to sauté until mushrooms are tender. Next, add the can of Rotel tomatoes, mix well and heat through. Sprinkle lightly with Bayou Blast and mix. Remove vegetable mixture from heat and set aside; keep warm. Fry or poach eggs. Toast and butter English muffins. To serve, using a slotted spoon, place 2 T of tomato mixture on a plate. Place an egg on top of this mixture. Sprinkle a dash of Bayou Blast on egg. Add a tsp of tomato mixture on top of egg. 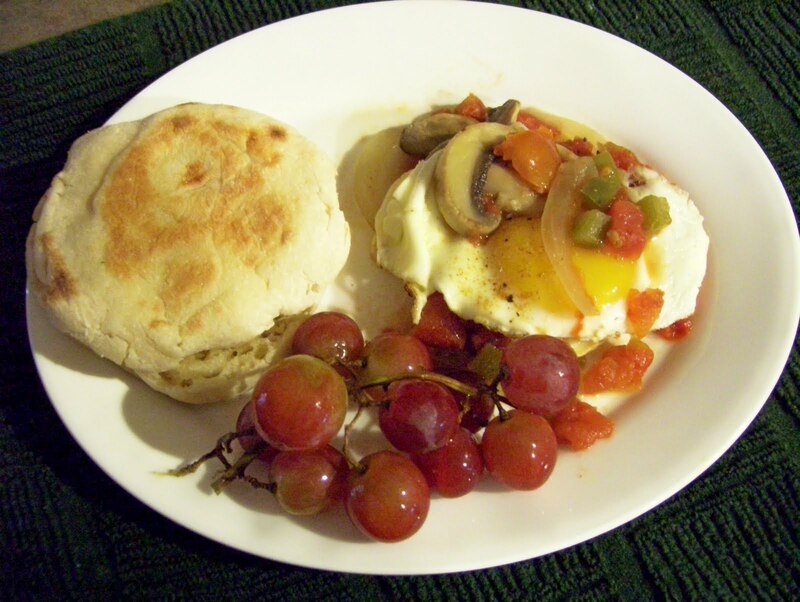 Serve with English muffin. *Note: if you are only making 1 or 2 servings, the leftover tomato mixture can be combined with chicken broth and red beans and rice to make a wonderful soup.